I can’t say exactly when I fell in love with this man. “It is a truth universally acknowledged that a single man in possession of a good fortune must be in want of a wife. I heard my laugh hit the silence of the auditorium. Apparently, I was the only one who got the joke (as a character from Emma read the first line from Pride and Prejudice). And so I slumped into my chair wishing someone—anyone—shared my sense of humor. Unbeknownst to me, this young guy who led worship and the drama ministry and acted in productions based on my favorite literature had just prayed a daring prayer two weeks before. I met him two weeks after that. And a week after that, I was the new pianist on his praise team (and he’s still my worship leader even now). I fell in love with the way he used his gifts and talents for God’s glory. There was his calmness, too. I loved my dad, but life with him wasn’t calm; it was loud much of the time and sometimes downright volatile. This man, though, measured his words with wisdom and careful thoughtfulness. Add to that his quick and witty humor that kept me giggling endlessly in the corner of the praise team section, and I realized that he was smarter than me and that was okay. We’ve never been an opposites-attract kind of couple. We’re probably two of the most alike people who God matched together. Except for the fact that he only cares about doing what’s right and not whether it pleases anyone else while I’m a people-pleaser. And the fact that he can rest and take time (perhaps . . . dare I say it . . .procrastinate) and I’m neurotically pushed to do and do and do relentlessly, first, fastest, and rest when you die. I can’t say when it happened, but at some point I fell in love. I can’t speak for him and say exactly why he fell in love with me. Nor can I say exactly why God loves any of us either, surely not my awkward, nervous, uptight, worrying self. Amazingly, though, this isn’t a “fall in love” kind of love at all. God doesn’t grow to love any of us over time or awaken one morning and realize how much He cares. It really is the beginning and the end of our story. Like the first time I saw my daughters, I loved them in an instant. I didn’t slowly grow to appreciate their character or develop feelings for them over time. “before I formed you in the womb I knew you” and David similarly prayed, “you created my inmost being; you knit me together in my mother’s womb” (Jeremiah 1:5, Psalm 139:13). God loved you before you squinted your eyes at the first burst of light, screamed out and got cleaned off, bundled up and handed to your mom. He loves you when you feel loved and when you feel overlooked, when you received a blessing and when you endured a trial. This love of his doesn’t wax or wane, change or alter or depend on us and what we do or say or feel or think. We’ve never been good enough, pure enough, beautiful enough, or wise enough to earn it. 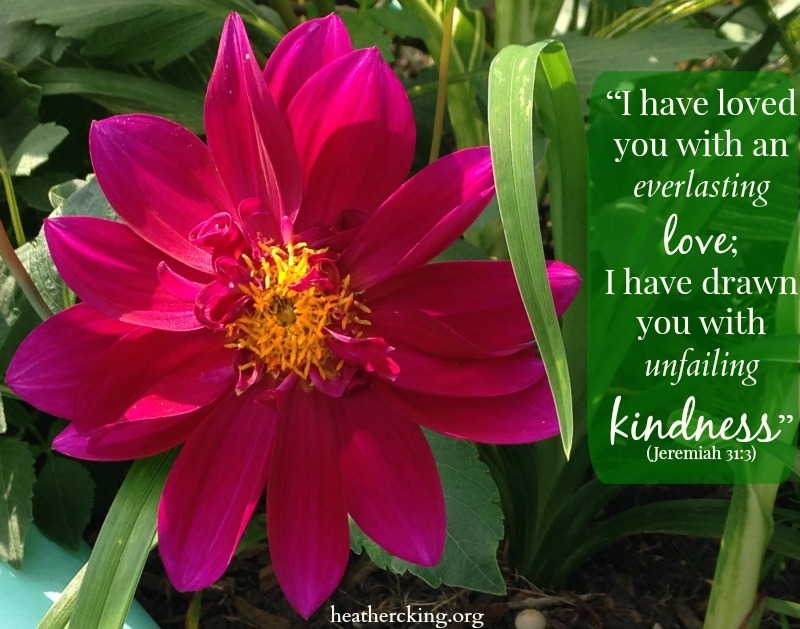 He says, “I have loved you with an everlasting love; I have drawn you with unfailing kindness” (Jeremiah 31:3). And what can we do with this everlasting and unfailing love, so amazing and confusing because it’s far more than we deserve? Will You Still Love Me After Four Kids, a Minivan and a Mortgage? Nice. If we all loved our mates the way Jesus loves….no marriage would fail, would it? That was very well done, thanks for it. Beautiful, Heather. Thank you so much for sharing your memories and the reminder that we are so wholly loved!